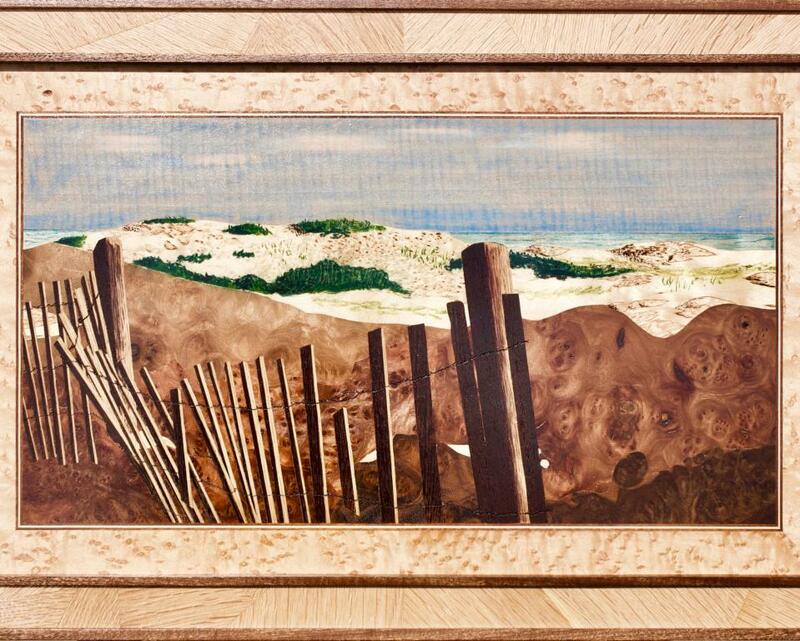 Painting with Wood, an exhibition of “wood veneer paintings” by Robert Bruce Weston, will be on view in the Mezzanine Gallery from April 5-26, 2019. The artist will host a free opening reception on Friday, April 5 from 5:00 PM-7:00 PM. Weston draws from his vast experience with wood when creating his art. He is a retired cabinetmaker with over 30 years of experience. During that time, he became a collector of exotic and domestic wood veneers. A veneer is a very thin slice of wood (usually less than 1/8 inch) prized for its decorative surface. Weston’s creative process is inspired by the patterns in the wood veneers. 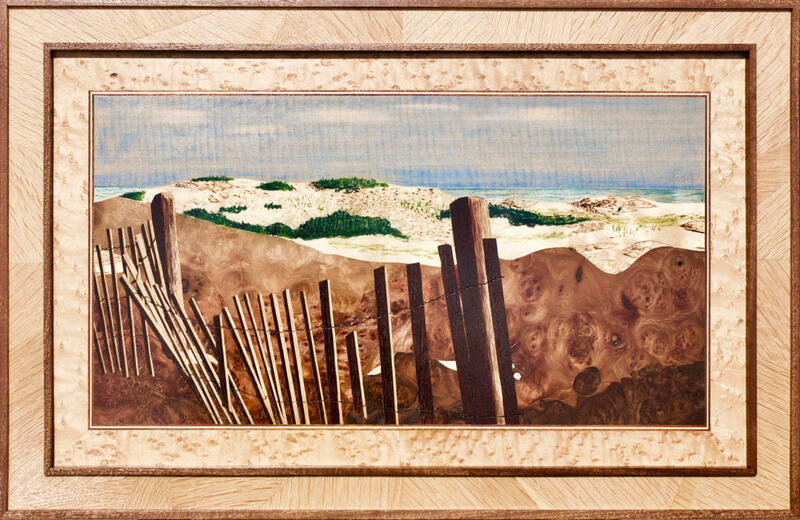 In some cases, the patterns in a wood veneer dictate the subject matter of Weston’s “painting.” He also recreates landscapes using wood veneers to translate the forms and shapes of the scene. The pieces are then cut by hand, taped together, glued to a substrate, and sanded. Weston prefers the natural color of the wood and doesn’t use stain. To add color for grass and sky, he uses oil pastels to tint the wood. Weston then applies 6 coats of lacquer and 2 coats of wax to highlight the beauty of the wood and enhance the surface. Each work is framed with a custom-designed frame made by Weston. The Mezzanine Gallery, open weekdays from 8:00 a.m. to 4:30 p.m., is located on the second floor of the Carvel State Office Building, 820 N. French Street, Wilmington. Visitors to the Gallery should enter via the courtyard doors on French Street and take the elevators to the Mezzanine level due to renovations in the building. The Gallery will be closed on Friday, April 19.